We Tell You Just a Little About Your ISA President, Myrna Bilton. Presenting Rendall & Myrna Bilton! Many of you are well acquainted with the Biltons of Belwood ON!! However; there are a number who have not shared in the joy of their Shuffleboard Adventure. This is a great story; this is a story of friendship, friendship between shufflers who can barely carry on a conversation BUT HAVE THE GREATEST RESPECT, AND YES, ADMIRATION FOR THE OTHER. It is also the story of a woman who won the respect and admiration of her Team Captain and National President to such an extent that she received the Prestigious Sportsmanship Award. We will begin with the story of Respect, Understanding, and Friendship. This story takes place in Coolangatta Australia where the Biltons participated in their first International Shuffleboard event. 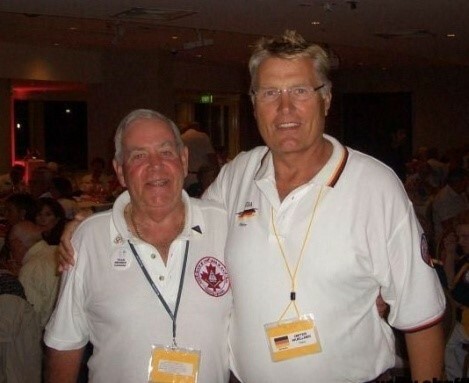 With reference to the pic on your left; Rendall is on the left; a German Shuffler, Dieter Wuellner is on the right. I now pick up the story as I recorded it while observing the match in October of 2008. “The player carrying #2 on his back was Germany’s Dieter Wuellner. Dieter was relatively new to shuffleboard. Notwithstanding his limited experience, he had acquired a knack for the game and from the beginning had demonstrated an ability to focus on what needed to be done as well as demonstrating the determination to get it done!! His pleasant mannerisms on the court more than made up for his limited knowledge of English while competing. Early in the Tournament, Dieter came up against Canada’s #10, Rendall Bilton, who up to this point had never lost a match. It was in Round 10 on Court 5 (Roof Top); Rendall and Dieter were at the Head; Ron Williams of Canada was playing Sebastian Runge at the Foot. Court 5 was relatively free of the sometimes nasty oceanic winds and Rendall and Dieter were having a close game, not of luck but one of strategy and skill!! The lead changed hands frequently >> and the careful observer could see that this match could go either way; however; given that Canada’s player had experience on his side, the betting was that Rendall would chalk up another win!! In fact the game went to the final disc of the 16th frame with both players making great shots. When it ended it was Dieter who had the higher number on the Board. It was what followed that was the “MOMENT NEVER TO BE FORGOTTEN” >> When the two shook hands, Dieter took hold of Rendall’s arm and thrust it forcefully to his chest; Dieter’s heart was pounding!! The Hand Shake had turned into a Heart Shake!! Rendall told me later that the emotion of the moment is something that he would never forget!! It was apparent that Dieter felt similarly. Stan McCormack of THE SHUFFLER. 2008 10 11. Sportsmanship Award goes to Myrna Bilton!! The Sportsmanship Award is a most respected symbol of interpersonal relations consistent with good sportsmanship at the International level. It is awarded to one player from each nation, the player who best demonstrates these attributes. Selection is the responsibility of the Team Captains in conjunction with their National President. The prestigious award was introduced by Jim Allen of Allen R Shuffleboard Co at the 25th ISA held in Lakeside, OH in 2006. The Sportsmanship Award is a significant criterion considered for entrance into the ISA Hall of Fame, Player Division. Congratulations to recipient Myrna Bilton. 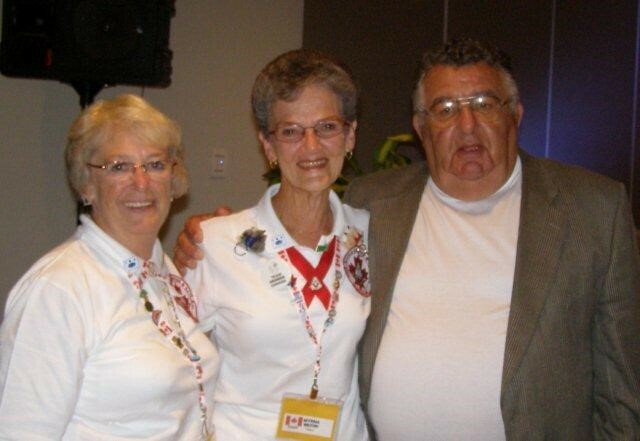 Shown in the photo above with Myrna (centre) are Lois McCormack, Women’s Team Captain and Gus Bondi, ISA President. The presentation was made to Myrna during the Banquet in Coolangatta, Australia in 2008. 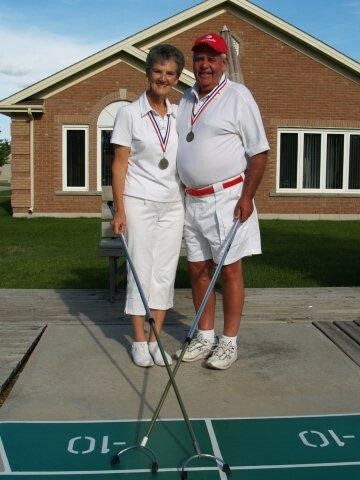 Myrna Speaks: I was introduced to shuffleboard in 1978 when my parents bought their Florida home. Every holiday I would join my Dad on the courts. We retired to our Florida home in Dec 1999 and have played in our park, Bayshore League. When we saw the ISA Tournament in Midland ON I knew I wanted to play for Canada. I love shuffleboard. Myrna Bilton. Stan McCormack writing in Calabogie, ON 2011 04 21.